The latest system update for the Wii U is now available for download, and it brings with it the previously announced ability to "Quick Start" the console to swiftly jump into a game without the prolonged wait. Another new addition is GamePad alerts and notifications, which allow the GamePad to flash up messages even when the Wii U console is in standby mode. And what would a system update be without the usual selection of mysterious "improvements to system stability and usability"? Don't worry, they're included in 5.0.0, too! Let us know when you've grabbed the update and what you think by posting a comment below. Nice! Wasn't expecting this till E3 direct. Also what else have they hidden in the update for the direct! ! Going to download it right now! I like the update. Everything feels snappier and this is how the system should have been at launch. I like this update. Pretty good. is there a nintendo life mario kart 8 tournament? @Kobeskillz What you're saying is putting a big smile on my face - looking forward to trying it out. I fired up our Wii U at around 8am and haven't seen the update while other sites have reported it's already live. @outburst just go to the eshop and it will say that you need an update. Thats how it worked for me. It does not automatically update? I'd check later then when I come home from work. Thanks! Just go to settings and then update. It's 1:30 in the morning, but I'm updating this Wii U anyway! Who needs sleep, huh? I a. Down loading now 08.15am UK taking its time must be busy period. Awesome, great timing for MK8! Well, after this update, any future updates will automatically install. awesome now they just need to allow us to make folders. Got too many games getting close to full since I buy almost everything digitally. Love updates that contain features I didn't know I wanted. I'd love it if we could get folders at some point though..
"System updates will now automatically install after download when the Wii U is in Standby"
I'm not at my Wii U right now, but I usually cut the power (essentially pull the plug) after powering down the system (either by gamepad or the console power button). Is this standby-mode something I can choose to avoid, since I'm pretty sure turning off the system during an OS update is a very bad idea. I actually really love this update and it does make the whole OS feel a lot faster. The quick start menu is ingenious and the Wii U honestly should've launched with the feature. As another minor update, I love how the notifications app is now a multitasking app. It makes loading and closing it a lot quicker. Essentially, I'm happy with the update! @Einherjar I saw the home button flash blue, so pressed it and got the notification about the update. @Pahvi Yes, after the update you get to choose whether to enable or disable this new mode. This is great an all, but give me folders already! My screen is so cluttered with millions of games. Well, the quick start menu doesnt seem to work for me. Whenever i start up the console, i get a screen telling me that "quick start isnt available right now and i should turn off and on the console and try again later"
@Einherjar you have to give it a while to set up after you shut down your system into standby... I suppose it's populating which apps you use the most. Your home button will flash when it's ready. I was playing with the update last night... Everything seems pretty snappy. I love that I can go right into Mario Kart 8 now though one thing I noticed that bugged me is that once you select a game it'll ask you to choose a user if you have more than one . I wish I could set some sort of auto sign in for the primary. Well it bloody well better stop my Wii U from locking up when it feels like it. I've sent my console and gamepad to Nintendo and they don't know what's causing it to lock up. Was really hoping for a photo/video app like on the original Wii, with screen capture and youtube uploading. Maybe next time. I just treat each individual page like it is a folder. Problem solved! @Dreamz good idea! I'll do that so. I need to get a hdd soon too m, with all these sales I have no space left on the tiny 32gb. Some very important improvements this time around! And just in time for all the newcomers that Mario Kart 8 will bring. The system REALLY could still do with improvements to the internet setup process, but that's probably coming still. Messages appearing on my gamepad in sleep mode? What kind of idea is that? Gotta love the updates Nintendo does for the Wii U, it always feels like free dlc when it comes to the added features. As for 3ds, well uh, stability is fine I guess. I'm only here for the stability. The next step needs to be having on screen messages/invites that friends can send like on PS3. @SetupDisk Yes...God Yes ! See they think everyone is constantly checking the miiverse and i get calls and messages on there i dont even see cause im into what ever im using or doing on the wii u. The pad isnt always in my hand they just need to make it pop up on tv screen or at least some kinda rumble or message note in the corner idk something more than having to hit the home button as much as i do just to tell. Anyhow im getting this update as i type. to answer the gamepad alert question. it just flashes the home led light til you press it. I keep my GamePad in my room on my charging dock, separate from where my Wii U is. Will that prevent it from getting Notifications? I must have updated the first couple of minutes cuz I was going on the eshop to see the video on how to get the free download code, then I turned it off, then about 10 minutes later, I turned it on and it wanted an update. Had to wait half an hour for it to update, then another hour for NSMBU to download. The second I fired the console up it began preparing the update. Now at 14%. Looking forward to seeing these new features in action! This is a pretty nifty update! I'm looking forward to see what they have in store for the next update! They really should add a digital deluxe promotion icon on the menu screen for checking your status. That free downloaded game ( Pikmin 3) gave me $5 and close to another. Thank you Nitty. Running out of windows to display my game downloads...reminds me of the wii all over again...need more windows Nintendo! Would be silly/annoying to be deleting games with a 500 gig hard drive!! I wouldn't be surprised if 5.0.1 was on the horizon already. I also tried to access the eShop at 8am this morning to be told about the update and updated. I then went into the eShop to pick up Swords & Soldiers. After doing the purchase, the screen froze and made the Wii/Wii U "Beep of Doom" (trademark pending) like when a game crashes hard on these machines, but then it stopped, the screen went white and I was back in the Wii U menu. When I pressed home to check downloads Swords & Soldiers was downloading, so no harm done beyond eShop crashing - I guess that's an improvement over having to unplug the console! Let me echo the desire for folders or more pages and an easier method of rearranging your items (what was wrong with the old DS menu which allowed for insertion?). I have four full pages and a partially full fifth one, so by the end of next year unless there's a real software drought I'm not going to have any more display slots - unless it automatically adds new pages once you start loading the sixth? @daveh30 Yeah, I can't connect to the Wii U at all. I just did a test, and the farthest I can get on the GamePad alone is the Quick-Start Menu. I must be crazy because I could swear they added another channel page in the home menu. Despite my several terabytes of space, I was quickly running out of channels. I wish Nintendo would update some kind of grouping option like the 3DS has. since the update everytime I try to play a game my external hard drive crashes and I have to do a hard reset. My hard drive is plugged with a y cable. @nathatruc Is your external hard drive one of the recommended ones on the list from Nintendo's website? If not, that may be your problem. @Prof_Clayton you can set between which times it is ok to disturb you. It defaults to 9oo to 21oo. You change this from the quick start page. Got it last night! Sent in a news tip also, since I know it hadn't been out long when I caught it by luck. I didn't get the chance to fully test it out, but man is it fast! Yeah, I had to force the update by going to the eShop (though I now know that I just could have made it happen by going to System Settings). Downloading now. @Sean_Aaron the pages expand automagically as you fill the pages with games and apps. I currently have 9 pages. This update made my Wii U a bit quicker than before. The HOME menu animation is faster, the notification app is included within it, so that the loading time when exiting the app is short to none. Not only that, but it also has multitask feature. There is so much to talk about the update, but I'm not in a mood to do it. I can't wait to try this out! I've always missed the days when you could start a console and get right into the game and this sounds like it's much closer to being back to that. @Figeluren Good to know - I figured they'd have to do something like that. I try to group things by putting a few empty channels between new games, VC games and apps/utilities so I've not fully used five pages yet. Folders would ease the need for scrolling, but I'd also like to see a way to simply insert a game since I like to alphabetise them, but don't love moving loads of little icons a space at a time. Quick Launch will definitely get some use from me and it's nice to be able to see all five of the accounts on my system at once. System speed has really improved now. Turning it on is much quicker, hard drive loading is quicker, home menu opening/closing is quicker, notifications opens/closes quicker. But yeah, I'd really like some folders now. I've got stuff on every single page now, and it's annoying to scroll through them all. @datamonkey I always put it on the charging cradle when not using it, and make it as a map. Turned on the Wii U and the Update screen was there so I waited a bit while it DL'd. Then waited a long bit while it installed. Then read thru the little bit - I liked where it listed our Nicknames and NNID - then messed around in eShop and Mivverse a bit. Turned it off and waited another long bit while the yellow light was on. Then the Home button blinked blue - reminiscent of the Wii days, nice touch - then a more in depth tutorial on the new quick start menu. Overall a nice improvement over the old menu. Wara Wara Plaza is nice, wish my Mii was controllable though - and think I'll be quick starting a lot and will hardly see Wara Wara again. And turning it on w/ HOME rather than Power is nice, that Power button is kind of tiny for such a big Gamepad, I think it's the same size as the tiny Wiimote. So thank you Nintedo for an update that does something obviously useful rather than just behind the scenes stuff, which can be useful but is less obvious. 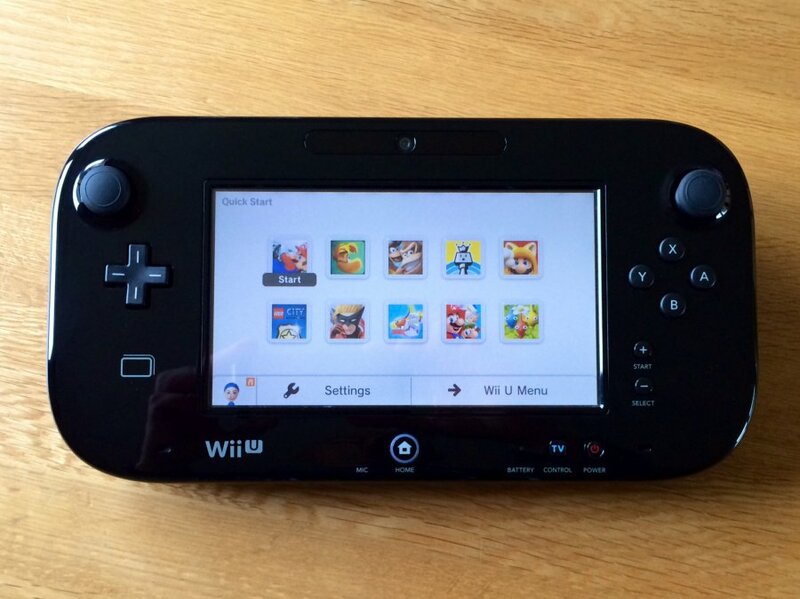 Now I'm wondering when we get the always on Mario Gamepad photo clock if they will be using the screen for updates. I can always use another clock. HEY READ THIS...NEED SOME HELP HERE!!! Has anyone else had this happen to them? Any help would be appreciated! nice, but when will we get on screen notifications? @Pahvi you can turn all the standby stuff off in the System Settings (for people wondering, this includes the 'Gamepad Notifications'). @datamonkey press the home (house) button -> controller settings -> display off. @Figeluren - What? You mean I can already do it and didn't know? Awesome. I will try it out later. @datamonkey Works in game too... only thing is the motion sensors in the gamepad turn the screen back on, and its VERY sensitive. Put it down, turn it off, and Back. Away. Slowly. Instead of Nintendo not only making great games, they make great updates also!!! @Iggly I got to agree with you on that! The update is great and all but.. Weird.. since the update everytime I start up my WiiU, the game pad has some kind of hicups.. But then, after a while it get's normal again.. I heard that some ppl are having problems with this update, one friend of mine got every game on the wiiu internal memory deleted..
How long does the update take? now where's that update that allows Nintendo ID's to be transferred to another WiiU? Update takes about 10 - 15 minutes. I was having the gamepad buttons and controller stop responding during Mario Kart 8 before the update last night. Now that the update's installed and running, I like it! Everything runs smoother and like someone else said, very snappy. The Quick Start Menu will be very convenient, I can tell. Switching between apps is painstakingly long for non moving media. @RedYoshi999 Your suggestion worked brilliantly! Thanks mate! The QuickStart options are really convenient. I have also noticed an improvement with the boot speed of the Wii U itself. If your friends have a short message in Friends List it will appear repeatedly when they are on the screen. Great update! The quickstart menu only seems to work for me if I fire up the console from the pad itself and not the system power button, but that's not a big problem. Hoping to see folders introduced soon! AND YET NO NINTENDO TVii IN THE UK, WHATS THE POINT IS HAVING IT ON THE MENU??? @sleepinglion Yes, that is how it is advertised to work....that way if you are starting up from a controller for instance, you are not left hanging waiting for input on the gamepad. Going from Power On, to the gamepad lighting right up with a menu, to a very short wait to the game launching is excellent. This brings us back to a time with the Nintendo's of old, where you just pressed power and there was no load time.....almost. @nathatruc I have the same issue of the wii u crashing and not recognizing the usb drive, but only with wind waker, which I downloaded after the update. I re-formated the HDD and I´m re-downloading my games, I´ll see if that works. It's great with this fast quickstart menu on the home button, but the power button should take me directly to wiiu menu as before, instead the quickstart menu shows up an I have to push a button 2 times to get to the wiiu menu.. I wish you could customize the software shown, so you never need to start at the home menu to find a software not used recently if its a favorite. I'll join with everyone else in saying this is amazing, but when are they going to allow for FOLDERS like the 3DS has (or better)??! An option for On screen friend notifications. Maybe I actually want to know what Friends are online without having to press Home first. Wow I really loved this update. The home menu opens and closes much faster and the quick menu is very convenient! The whole UI seems to feel more nimble and snappier. Loving it so far. Now where's our folders and customization? Folders are indeed really urgent... But that aside, it's like a pre-re-launch of Wii U. Needless to say that my expectations for E3 are high. @daveh30 Alternatively you can hit the home button on your wiimote, navigate to turn the display off with the key pad, and then you don't have to worry about picking up/putting down the gamepad. Personally I won't see much improvement from this update. I usually used the whole process of booting up the Wii U to get settled into the couch, arrange my coffee and so forth. No time savings for me! @gatorboi352 I don't care about the onscreen friend notifications, but it's definitely time for Folders. I was a bit dumbfounded that they didn't include them in the first place after doing it on 3DS. @Grumblevolcano it's not on the list but it worked perfectly and since the update it crashes everytime so I'm trying to copy my saves because all of my saves are on the drive. I had just bought DKC: Tropical Freeze yesterday and was planning to play with a friend last night. I even made sure to download the software update ahead my guest's arrival. But when I booted it up to start playing, it was system update and gamepad update time (two separate updates?). Thankfully it went pretty quickly, but man... it seems like every time I buy a new game, I have to wait too long before I can start playing it. What is this, a Sony system?? you can never have too many system stabilities! i hope that when/if they give us folders that they're not just the boring blue like the 3DS's. I want the folders to be able to have themed icons like NES or SNES or Mario or Zelda and so forth. I just don't want to ruin my pretty menu with bland, unimaginative folders. Anyone else notice weird USB Hard Drive issues after this update? My quick start doesnt seem to be ready any one have any idea how long it takes? My update works without problems, but I wont use QuickStart. It need to have standby enabled. If you have it so, it starts my external hdd every time it "wakes up" and I don't like this. It's is significant quicker only, if you don't select your game directly after the list shows. @PinkSpider your controllers home button will start to blink when it's ready. Specifically it looks like they are throttling the power going to the USB ports during games etc. Wife would play MK8 and it would act like the drive didn't have enough power or became disconnected. I had the HD connected with a Y USB adapter to the rear ports and moved them to the front ports. It worked for one test. I also ran a test and moved a bunch of data to the HD with no problems, but god is USB 2.0 soooooo slow compared to 3.0. So we shall see if this new quickstart is better or not, I may not use it. I didn't really care that much til I found I could launch the browser from there as well. Great stuff. Nintendo ... this is all nice, but what we need is the ability to have digital games tied to and account, instead of hardware. Love to buy another Wii for downstairs, but I'm not going to pay twice for the same games. If i bought another Wii however, we'd play it a lot more as a family and buy more games. @kwandar Buy physical. Problem solved. @LunaticPandora True - but I like the digital convenience, and its a stupid work around for Nintendo, as they end up making less $. Not only do they charge more in their store, they don't incur the same costs of selling through retail. On this count, Nintendo is stupid. They need to fix this. My Wii U Game Pad is always in a case. So I don't know if I want those notifications. How does it even work? Like the TV remote? The Game Pad has actual power to display the notifications without the Wii U on? Uncanny. @dumedum You can turn it all off, in fact I just did to see if I notice any stability improvement with my hard drive. It takes a long time for me: 30+ minutes. @LunaticPandora yeah, because all eshop only and virtual console games come in physical form. If you're family would play the Wii U more downstairs, then why not move it there?? Sorry if it's intrusive, but I don't understand the thought process of how buying two consoles would get your family to play together more often. I like the new HOME menu. Looks snappy, and its animations are hilariously fast! @MoonKnight7 Sorry if you misunderstood. With 2 spots in the house to play (both have large screens) they'd be played more often as there is more availability (ie. when someone is watching the other tv or playing on the PS3). Just the fact that it is easily accessible increases usage. Yeah, I get what you're saying, but I still don't understand. I always just shared with my siblings when I was growing up, whether it was tv's, consoles or whatever. If I had to play elsewhere, I'd just move the console to create my own "availability." I'm not trying to pick an argument or anything, I just find this a bit superfluous. Nintendo needs an update so people can switch the RGB settings from RGB Limited to RGB Full. Good update. Now let's hope they keep updating consistently with more features. @Figeluren - You misunderstood what I meant. I meant it would be cool if you could turn off the Gamepad screen the whole time you are playing the game (if you're not using it obviously!) so it would save precious battery while it's not being used. I rarely use the Gamepad screen unless it's a necessity so being able to turn it off in games that don't use it - which is quite a few - would be a great bonus. Noticed I had an update when I got home. Better usability is always welcome! Is there an option for no "audio ringtone" notification on the gamepad? Couldn't find one so I opted out of gamepad notifications all together (plus, they seemed a little naggy, as well). Is it really that hard to release an update that will allow me change the background of the Wii U and 3DS menus. I'm getting really bored with the plain white tbh. Having a selection of colors and being able to use photos from the 3DS photo library for a background like the psp would be awesome! @LunaticPandora Physical introduces more problems. Like fan noise. Extra clutter with boxes everywhere. Inferior versions (Depending on the game the digital ones have less glitches). Most importantly for me though. If it is digital I end up playing it more due to it just being there (Regardless of how much I do or do not like the game). @MoonKnight7 I also didn't mention the other reason that games should be tied to an account, not hardware. Faulty hardware happens. I'm far from the first person to want this from Nintendo. I still don't understand why Nintendo doesn't give you the option to automatically start a disc based game on startup. The Wii didn't either. If I'm only turning on the system to play the game in the disc tray then why do I have to wait for the menu screen to load just so I can click on the game's icon and load the game up? Mine keeps getting an error at 99%. I tried looking it up but it just said to contact Nintendo support. Must be a rare and /or serious error. I tried playing Mario Kart 8 and it worked a charm; ditto for my kid with her account and Lego City. No hard drive issues, but I have an externally-powered HD - I would remind people having issues that Nintendo does recommend not using USB-powered drives, but you takes your poison, you takes your chances as they say. I still need to run a backup of MK8 and some other new games to my USB-powered backup drive - hopefully everything's cool! Surprised at how much faster it gets me into playing a game, actually. Very nice. The update is not bad but my wiiu gamepad wont stop blinking its getting annoying and i got a notification from nintendo when the power was turned off. It was mario and with giant letter's saying hello from nintendo it startled me. You'll probably get used to it, but you can turn it off if not. No one here is disagreeing that an account system should be in place. @kwandar Actually, the games are tied to the NNID. The NNID is tied to the hardware though. Plus, Iwata already said several times in investor briefings that the full account system is happening. It's a matter of when, not if. I don't get how fan noise and box clutter would be considered "problems." I'll give you the glitch one, as that does seem to be the consensus. Though I've only ever encountered one glitch from my physical copies. @tebunker Haven't had any problems with my USB drive, so no. I made sure to get an enclosure that isn't USB bus powered though (I don't know if that's the problem you're having, like you're saying it is...that doesn't make much sense. AFAIK, the USB bus gives whatever power it gives, would there even be a way of throttling it?). Everything's working fine for me, and I'm fully embracing this update. It's all fun! All this stability and my system STILL hangs if I watch more than one episode on Hulu. Other than the quick-start dealy right after turning it on, I don't notice a whole lot of difference. Then again, I was never previously bothered by its speed of interaction with menus and such. Maybe I just don't pay quite so much attention to that sort of thing. Glad the more longtime owners are satisfied by it, though. @Grimlock_King The RGB thing and lack of folders are 2 things that feel like they should have happened years ago yet here on 5.0 they're still not around. It is a running joke at this point. Its a shame as I look at the gamepad and see how much more colorful the games are compared to my monitor. @tebunker Thanks! I saw the mute option once I restarted the Wii U but I still chose to not receive GamePad notifications, as they seemed unnecessary and potentially annoying, since I stay current with most Nintendo news on a daily basis. See with the update well before the update your user mii would have a blue background if connected orange if not now it's just grey so how do u tell if online or not?